Swagbucks has a new Team Challenge that started today! 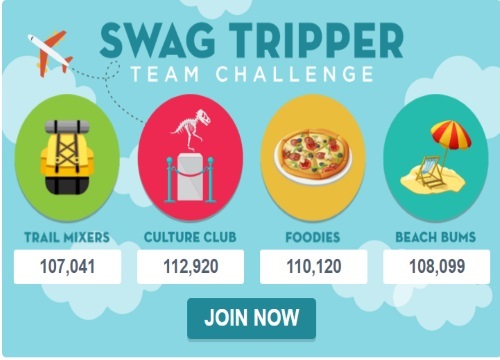 The Swag Tripper Team Challenge begins Monday, April 11 at 8:01am PDT/11:01am EDT and ends at 12pm PDT/3pm EDT on Friday, April 15! Members of the 1st place team will receive a 40 SB Swag Up Rebate, members of the 2nd place team will receive a 20 SB Swag Up Rebate, members of the 3rd place team will receive a 10 SB Swag Up Rebate, and members of the 4th place team will receive a 5 SB Swag Up Rebate! Your SB Swag Up Rebate will be made available on Friday, April 15th by 4pm PDT/7pm EDT and will expire on Saturday, April 30. BON VOYAGE! MyGiftCardsPlus - Make any purchase at MyGiftCardsPlus and when you receive your SB you'll contribute 125 pts to your team. Surveys - Survey Completes Earn SB when you complete a survey and you'll contribute 25pts to your team! Discover - Earn SB by discovering great deals on your desktop or through the Swagbucks Mobile App and you'll contribute 24 pts to your team! Search - Earn SB through Swagbucks Search and contribute 17 pts to your team! Watch - Earn SB when you watch entertaining videos from nCrave and Watch and you'll contribute 15 pts to your team! Swago Codes - Redeem daily Swag Codes through the SwagButton browser extension or the Swagbucks Mobile App! Contribute 4 pts to your team. If you are already a Swagbucks member, click here to get randomly assigned to a team. I am on team foodies! Good luck everyone.